When I first saw pictures and videos of this product circulating social media, I knew I had to have it! 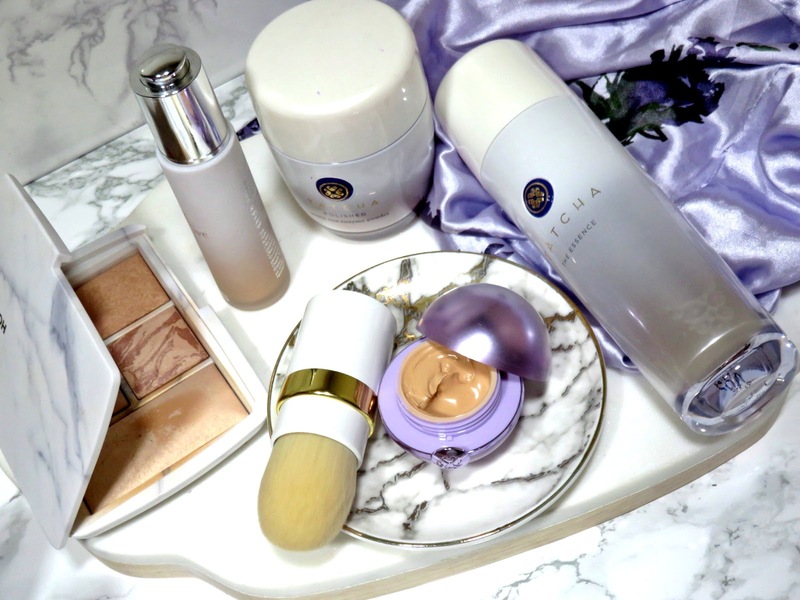 I have a deep love for skincare-makeup hybrids and I adore Tatcha's skincare products! Recently they have entered the realm of makeup, which based on the quality of their skincare products, I won't complain about them releasing some makeup! This product instantly intrigued me because I love my Colorescience Total Eye 3-in-1 Renewal Therapy SPF 35, check out my review on this skincare-makeup hybrid here. This looked quite similar and the Sephora Spring Bonus sale, which seemed to last forever this year, made me break down and get one. 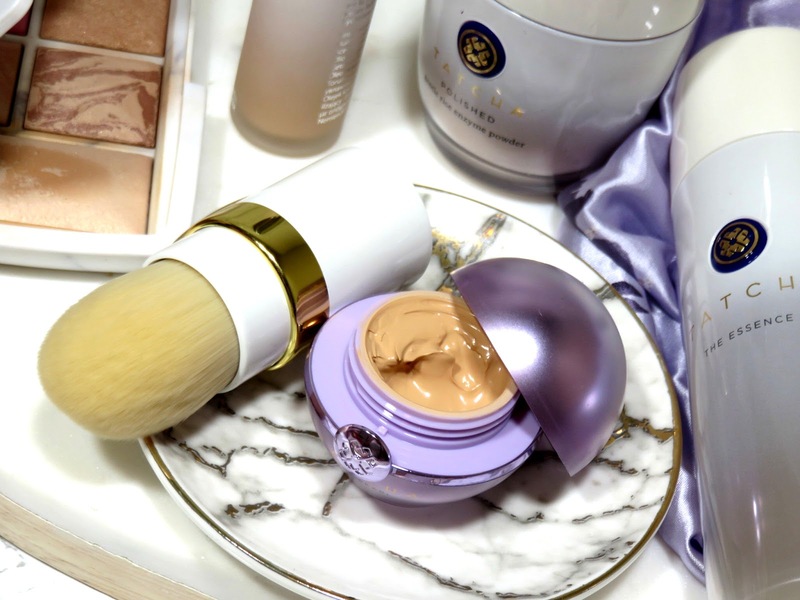 The Tatcha The Pearl Tinted Eye Illuminating Treatment retails for $48.00 USD and is available at Sephora and other retailers. 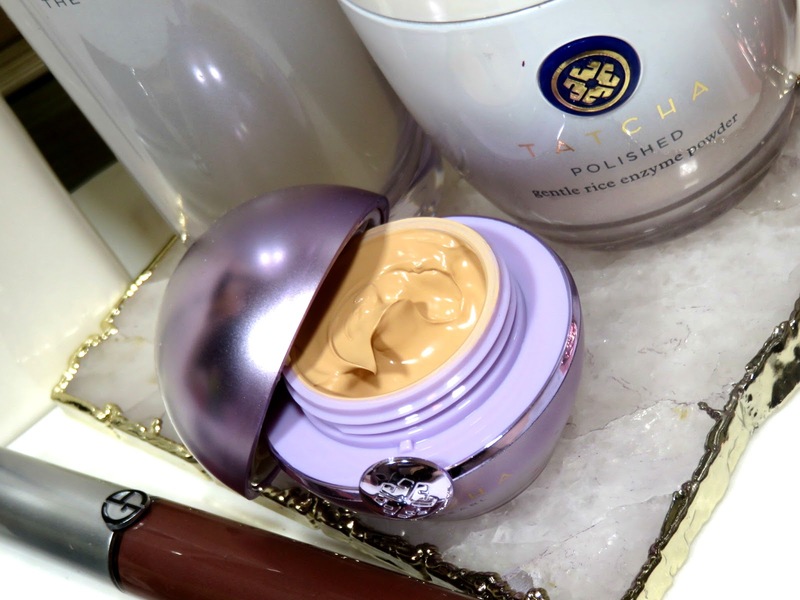 The product is housed in a beautiful purple pearl-shaped jar. The treatment comes in three shades: Moonlight (light), Softlight (medium), and Candlelight (dark). 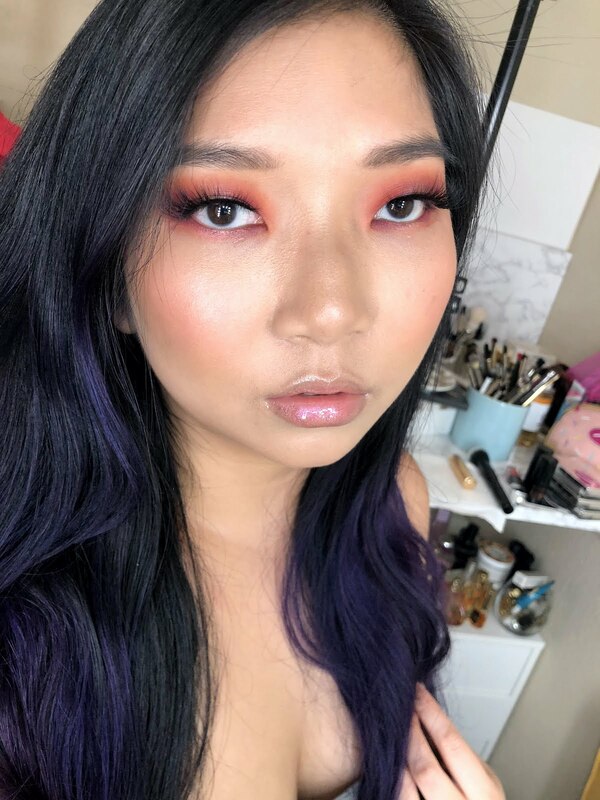 I was torn between the light and medium shade because I usually like my under eye makeup to be slightly lighter for brightening. However, the medium shade appeared to have a peachier corrective tone but seemed a bit dark. There was only one set of swatches at the time I purchased this and so I went with Moonlight (light) because I feel like it would suit my skin tone and brighten my under eye area. For reference, I am about a NC30-35 in MAC foundations. I am currently a bit lighter because we are just entering spring, however the Moonlight shade works but I feel will be a touch too bright come summertime. I'm kind of torn on whether I need the Softlight as well. The product has a very light gel-cream concealer consistency and feels very soothing, cooling, and hydrating on the skin. A very little dot of the product goes a very long way! The size of the tip of a needle is literally all you need! I use my ring finger to pat the product into my skin and it really brightens and offers some coverage. The coverage is light but this something I really like, I often use the YSL Touche Eclat and other very light coverage products for under my eyes. I don't like the feeling of heavy concealer under my eyes or the look of heavily concealer under eyes. This product offers a natural coverage and texture to that area, making it look very healthy and fresh! I have to say, I don't like this product on bare skin. There's something about the formula that doesn't blend very nicely into bare skin, which is strange, considering it is a skincare product too. The product has a consistency closer to concealer than it does to eye cream. When you apply it on bare skin, it doesn't fuse with the skin, it sits on top of it. I recommend prepping your skin and applying this product after your foundation/base product. Also, I find a beauty sponge helps a lot with blending this product into the skin. I usually take a dot of the product rub it in between my two ring fingers to warm up and then I pat it across my under eyes, then I take my beauty sponge to press it into my skin. You can also just use your fingers to continuously pat the product into the skin, it makes for a nice finish and good coverage, but this method takes a lot more time. This product does "set" after being blended in, making it quite long-wearing and prevents it from sinking into lines. I didn't set the product and noticed very little creasing in my fine lines but I did not notice a bit of fading throughout the day. I think the best way to ensure bulletproof wear is to set the product. Tatcha Eye Treatment on left eye only, can you tell the difference? Since I bought the lightest shade, I find this product extremely brightening and illuminating! I would like an expansion of the shade range since these are not as sheer as I expected them to be. I may end up purchasing the medium shade next time. It provides an excellent coverage and feels very light. It seems to blend very well into my base products and looks really seamless. I LOVE that this product doesn't crease, even when I don't set my under eye makeup. I think the coverage for me is enough and I don't feel the need to use another product. The coverage and illumination seems to last all day when set and maintains a bright and fresh look! 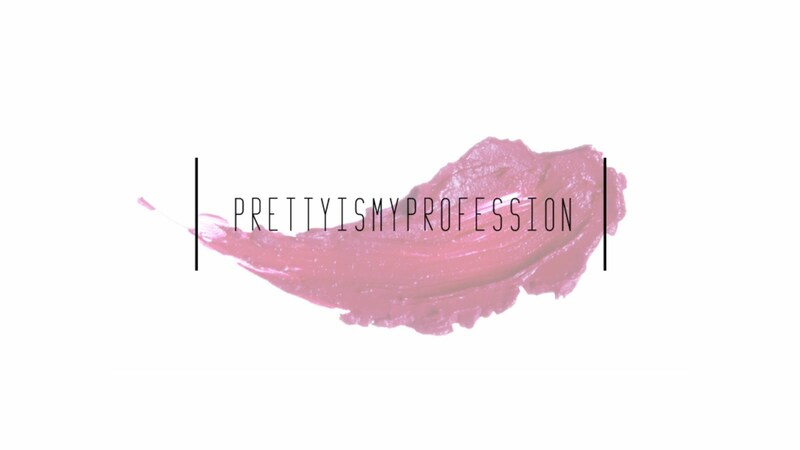 I like this product a lot and would highly recommend it! It feels like a treatment and conceals very well. I can't attest to the skincare benefits, I don't imagine there will be dramatic results over time but it would work more subtly. Even so, I think it is a great product that has replaced my other under eye concealers. I will often mix this product with my other under eye concealers because it helps with the consistency and blendability of the product.